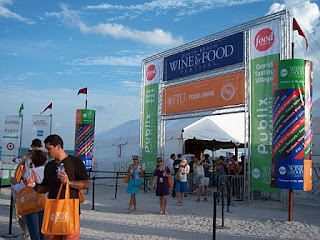 On February 24, 2008... i got a chance to go to the South Beach Wine and Food Festival, hosted by FIU (Florida International University), Food and Wine Magazine and The Food Network. meet your favorite celebrity chef. I bought a $210 ticket for the Publix Grand Tasting Village (Culinary & Lifestyle Seminars and American Express Grand Tasting) event that ran from 11am to 6 pm. It was located on 13th street and ocean drive, Miami Beach. It was a perfect day, a damn good day to bee on the beach... that's for shore. I knew that the event was goin' to be held on the beach so I wore my sandals and my fave shirt "Red Hot Chef"...lol. I was greeted by Delta Sky 360 Team. They gave me my goodie bag and wine glass with a special strap that goes around my neck that holds my wine glass :) nice... i swear they think like me... cuz everyone that knows me from skool and work.... i always forget things, so i like to put it around my neck...so i don't loose it : And there was the entrance... i knew that once i stepped in... i was goin' to have the time of my life... an opportunity, sure worth... 200 dollars! Alright... there is the Publix Grand Tasting that starts at 1pm... so what do i do in the mean time? Seminars!!! 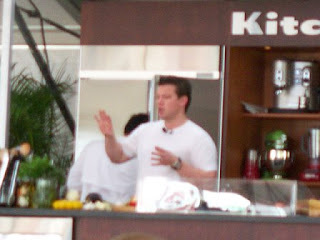 Not just any borin' Seminars... these were being hosted by my favorite Food Network Chefs!!! 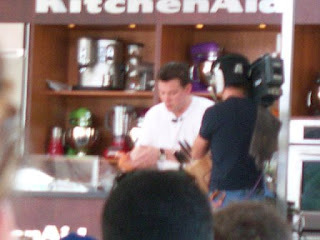 There were Three tents Kitchen Aid Stage A & B had the Chefs, and Target Stage C had the Local Chef competitions.